Ufa’s week-long festival of hockey is approaching its conclusion, and Saturday’s Skill Show delivered all the thrills and spills expected of the gala occasion. 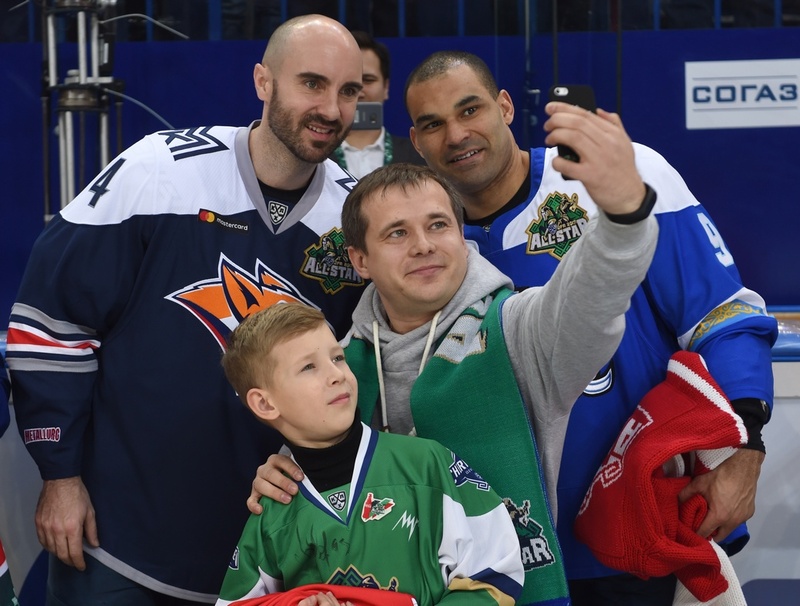 With a carefully selected assortment of the KHL’s biggest stars under one roof and – for one day only – given a license to show off, it was a day to celebrate hockey as pure entertainment as well as competition. 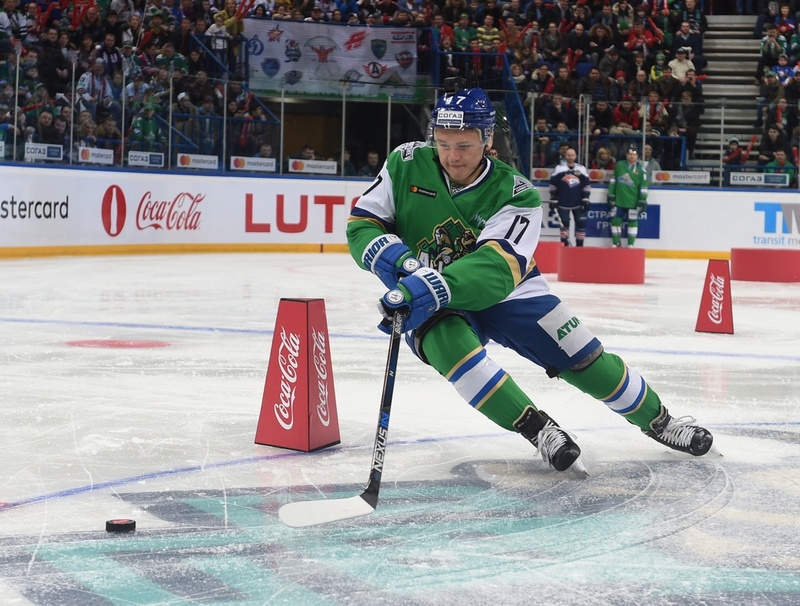 From trick shots to a drink of water, via a new KHL record, the 2017 All-Star weekend got off to a great start in front of a sell-out crowd in the capital of Bashkiria. The first event, speed skating, set the tone for the day. In previous years, no player had completed a lap of the rink inside 13 seconds: today that record was shattered twice in the space of a few minutes. Torpedo’s Alexei Potapov was the first to do it, circling the ice in 12.952 seconds, but his record lasted just a few moments before Enver Lisin smashed it with a time of 12.450. 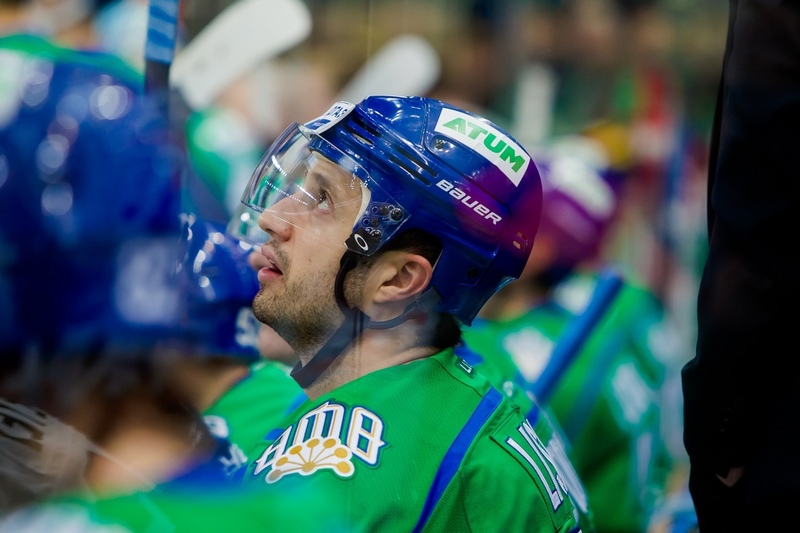 Lisin, a Salavat Yulaev forward, later explained that knowing every inch of the Ufa ice helped and admitted his greatest fear was falling over on the corners. East 1, West 0. Event two was a newcomer – hockey biathlon. Much like the ski version, players needed to combine speed around the course with accuracy in shooting at targets. Unlike regular hockey nets, those targets proved difficult to hit: only home hero Kirill Kaprizov succeeded on both attempts, his rivals find it easier to tease out the tiny gap between glove and piping in a game situation. East 2, West 0. The hardest shot is always a big deal at All-Star events, especially after Alexander Ryazantsev’s world-record strike was clocked at 183.67 km/h in Riga a few years back. This year’s contestants couldn’t challenge his record; Igor Ozhiganov of CSKA won the contest with 154 km/h and later suggested that only Shea Webber was capable of matching Ryazantsev. East 2, West 1. Marks for artistic impression are usually seen in figure skating rather than hockey, but the penalty shot contest rewards beauty and innovation over stuffing the puck in the net any old how. Each year, players vie to come up with the most unexpected ways of taking their penalty shots. We’ve seen bows and arrows, blazing sticks and players rushing the net in shopping trolleys, so the class of 2017 had plenty to match up to. Chad Rau, the first Kunlun player to feature in the All-Star Game, treated the crowd to some juggling, while Spartak’s Matt Gilroy opted to pay Admiral Igor Bobkov 5,000 rubles to go and sit on the bench and give him a free shot. Maxim Afinogenov used two pucks, Pavel Datsyuk conjured some more devastating dekes, but the winner was Vladimir Tkachyov of Ak Bars. He executed three perfect spins with the puck on the end of his stick, before smashing it down into the net past Igor Shestyorkin. Later he told reporters that the hardest part was coming up with a new trick, when every year sees more flamboyant attempts. East 3, West 1. — КХЛ (@khl) 21 января 2017 г. Earlier this season, footage Salavat Yulaev goalie Andrei Gavrilov went viral as he calmly took a drink of water while a Dynamo Moscow attack ended with a shot wide of the target. Back in Ufa, in front of Gavrilov’s home fans, the opportunity for a tribute to a uniquely laid-back netminder was too good to waste. Pavel Francouz of Traktor picked up the bottle, while the Western Conference played the fall guys and squirted a shot wide of the net to the delight of the Ufa crowd. Francouz won that duel, but the points for the offense vs defense event went to Team West and Ilya Sorokin. East 4, West 2. The traditional relay finale saw each team nominate five skaters and a goalie to race around the ice, with the goalies tackling the course backwards and carrying their sticks. Once again, Team East got the verdict, winning the event in a style so emphatic that not even Sergei Gimayev’s protests to the officials could change anything. East 5, West 2. The All-Star action continues 21st January with a new-look challenge competition. Instead of the old one-off game between East and West, 2017 sees the four divisions of the KHL compete in a knock-out contest. The games will be in a 4-on-4 format, and this year the head coaches are assisted by well-known pundits, commentators and experts usually seen outside of the team benches. The action starts in Ufa at 11 am Moscow time, and will be streamed live on KHL.ru.